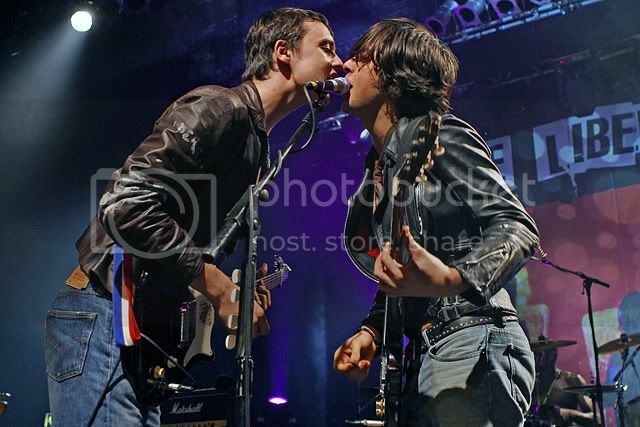 well,i can't argue with that... the libertines were genious and it's a shame they split up in such stupid way! awwwwwwwwwwwwww... it brought a tear to my eye... thanks!!!!!!! i liked that one. what a great pair those two! One day, I needed help on something on my pc and a guy came over to have a look at it and I had the window open so that one would only see Pete and Carl, but not the mic... It rrrrrrrrrrrrrrrrreally looked like I had a pix of two guys snogging! hahahaha! Like I collected pix of guys snogging... ha! I didn't keep that pix as a background after I realised that and was done laughing! lol. really, random, but i wanted to share. find the pix and post it here. wow,that really is a great setlist!